Click here to watch the film made of this trip by Ben Stookesberry. 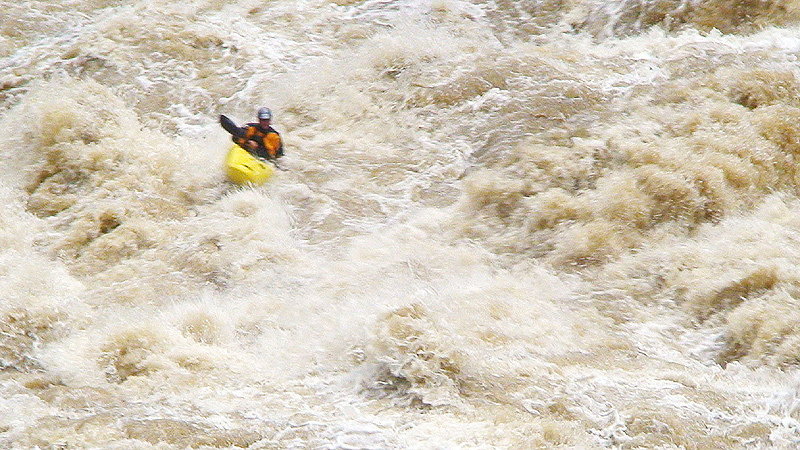 Copyright © 2008, Jesse Coombs and Oregon Kayaking. No part of this page may be reproduced, linked, or copied without the express written permission of the Oregon Kayaking webmaster. 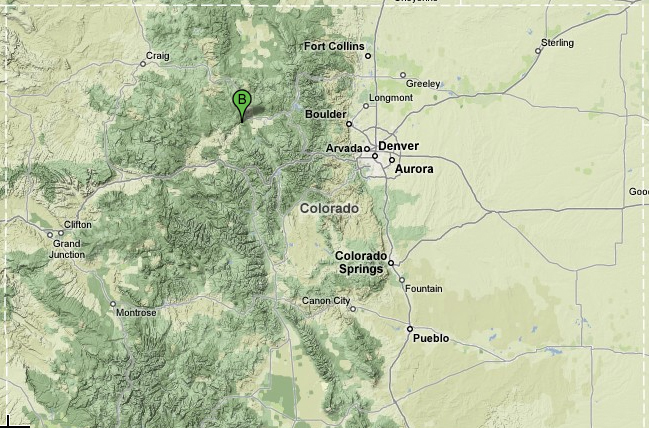 During the tour for Hotel Charley Three, Ben Stookesberry and I had a day off in Colorado. We had been talking about paddling Gore Canyon, so we took care of some business in the morning and headed up I70 toward Summit County in the early afternoon. We knew we were running short on time, but we were hoping to get a run on Gore before we ran out of light. We didn't know the level, but we'd heard it was around 2,500 cfs. That meant the river would be high, because recommended flows for Gore range from 500 to 2,000 cfs. We didn't know it at the time, but we were about to put on at double the maximum recommended flow. Looking downstream at the Colorado just below Gore Canyon during the shuttle. We got to Gore Canyon about six p.m. with two hours of daylight left. We ran into a friend who had just taken off and he told us the river was high. He said they they portaged some of the rapids but thought we might run them. We thanked him for his encouragement and beta and headed off to the put in. After gearing up we ate a little food and then began the forty-five minute flatwater paddle to the entrance in the canyon. When we arrived at the entrance of the canyon, we saw that that the river was high. Very high. I had done this run several years ago at normal flows, and everything looked completely different as we looked downstream! First of all, there were no boulders visible in the river, and there was wood coming downstream as the swollen river swept the banks clean of debris. As we sat the flatwater above the entrance of the canyon, we were getting that angry, fired-up vibe some rivers give off when they are flooding. We ran Applesauce blind and then wisely got out to scout Gore Canyon rapid. We saw a manageable line down the middle using the airplane turn at the top to enter the meat of it. From there we worked our way right past huge holes and then back to center to run Scissors. At this level, which turned out to be just under 4,000, Scissors looked like three heads of cauliflower that would eat you alive and then spit you out. We both ran the center of Scissors and eddied out river left. We then lined up for Pyrite running a left of center line at the top to avoid a ledge hole and then right through the bottom hole. Unfortunately I got flipped in the first hole and flushed to the left and had to probe that side with wood in the river all around me. I was not comfortable about that line, but once I was in it I had to just get through it. Ben had a good right line, we both avoided the hole right below Pyrite and continued down stream. Next we came to Tunnel falls, which wasn't a falls at this level. Tunnel consisted of a big, sloping entrance into a very unfriendly looking hole. It looked like it might flush on the left, but the left side pushed into a very nasty looking undercut that looked like it would take your head off. It was late in the day and we didn't have time to set safety properly, so we chose to walk it. After Tunnel we ran the HUGE hole called Toilet Bowl on the left. Ben went first, and right after he took off from his eddy a beaver the size of a hundred pound dog surfaced in his wake. I couldn't believe the size of this beaver and the fact that he was getting in the water right above a big rapid in VERY fast moving current and rapids. But sure enough, as calm as anything he sat in the water for a second, took a breath, lowered his head, and then headed off for the middle of the river! WOW! I was supposed to be watching Ben's line but I was completely distracted and amazed by the Beaver..
After running Toilet Bowl we headed toward the monster called Kirshbaums. Kirshbaums was an unbelievable combination of huge wave, diagonals, reactionaries and holes. I led this portion but had no recollection of the line. We started center and went right, weaving our way through huge waves and monster holes. We came to some eight-foot ledge boofs that we had to clear with our Super Heros or risk getting a serious beat down that may have led to a long swim. What a fun and a full day! We arrived at camp and found an amazing dinner waiting, courtesy of Melissa, Ben' s girlfriend. "Why not run it even higher?" The next morning Ben, Melissa and I had a relaxed yet somewhat nervous morning thinking about putting on Gore Canyon again. Ben and I encouraged Melissa to put on the river and portage the tough rapids, but luckily she had enough common sense to ignore our somewhat unrealistic optimism and stay firmly on solid ground. Then we checked the level. Ben had put a river level marker of three medium size rocks at one of the boat launches the previous night and the water was just licking the bottom rock. When we got up the next morning, his river marker was completely washed away! Yikes. Ben joked that we could just skip getting in there today if we wanted, but I was excited to check it out, and I think he was also. We had a great breakfast and headed off to the river. Melissa drove us to the top and we drank and ate a little before heading back out for the flatwater leading up to the freight train of destruction which is Gore Canyon at 5,000 cfs. The wood we had seen in the river the day before was nothing, consisting of branches and small stuff. Today there were entire railroad ties going downstream, huge ten foot long logs and just about anything else this ridiculously swollen river could claim from its vastly increased river bed. Again we ran Applesauce blind and flushed through the massive tongue and reactionaries below. We got to scout Gore rapid and there was no doubt that the river was much higher than the previous day. While the lines were essentially the same, the holes, waves, diagonals, reactionaries, moves and difficulty were MUCH bigger and MUCH more difficult. The roar of the water was thunderous, and it felt like the river was sucking the air out of the canyon as it sped downstream between the jagged rock walls. I wasn't sure I wanted to get in there, and neither was Ben. He pulled his boat up after deciding he wasn't interested in Gore Rapid. I decided that I thought the line in Gore was doable and if I didn't like how it went I could still get out before Scissors and Pyrite. 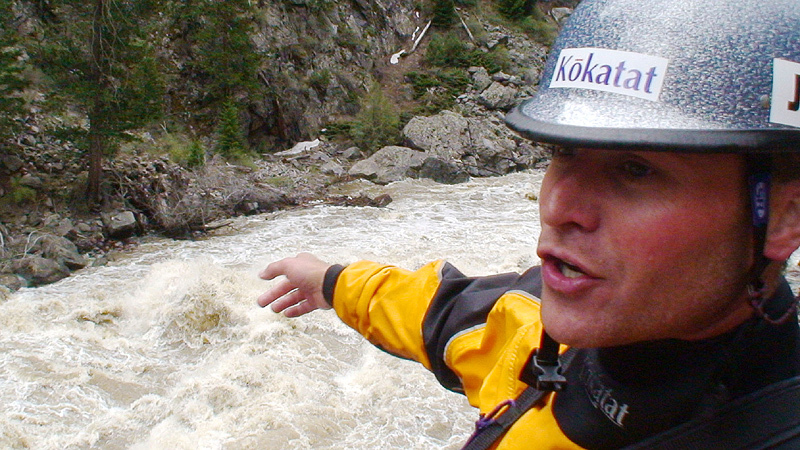 The author talks about running Scissors, just downstream of Gore Rapid, during the long scout. 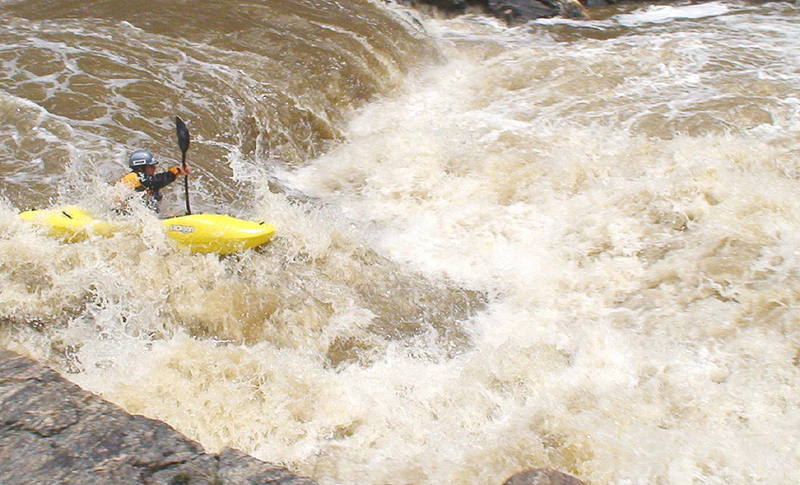 Ben set up two cameras and I headed off to test my skills on Gore rapid at 5,000 cfs. I had a great entrance move and then lined up for the toughest part: the airplane move at the top. This move was pretty easy yesterday if you just lined up correctly. Today was a different story though. The water was surging so much that the entrance move would fluctuate between a huge green wall with a curl on top to a four-foot pile of white water and back again. This was a concern, because the line was very thin. On the left side of desired line was a ledge hole that looked like it might hold you in its bottomless crevasse for a long time. On the right side was a set of folding currents and an extremely violent hole that looked like it would rip you out of your boat before releasing you to the merciless torrent below. I determined that no matter what what happened, when I got there I would do my best to punch through. This mindset is critical when rivers are flooding because there is a much higher level of unpredictability to the lines. With that positive image in my mind, I ran the entrance perfectly and was now completely focused on the quintessential airplane move. 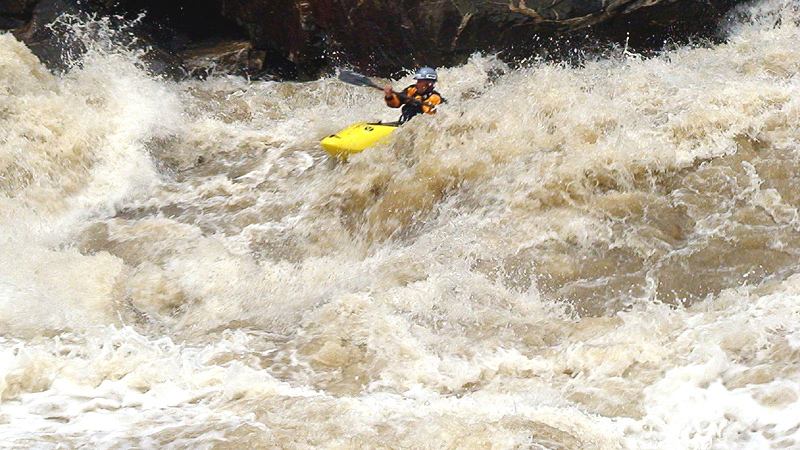 The author enters Gore Rapid at what felt like fifty mph.. When I got to the airplane turn I stayed a little more left than the ideal line to ensure I didn't drop into the nasty fold. The airplane must have become a green wall right when I got there, because I passed through it extremely easily. This meant that instead of taking the green tongue into the next section I caught the edge of the ledge hole. I was pulled into the hole and braced on the left in a maw of brown whitewater, and then Ben said I completely disappeared! I braced on the left and pulled and before I knew it I was headed downstream again. From there I worked through the chaos left to avoid the huge holes below, and then I was heading into Scissors. Scissors actually looked better at this level because it had a middle wave tongue. I didn't get quite all the way middle so I punched a huge wave hole and reappeared down stream upright and headed in the right direction. I whipped into a surging eddy on river right and paused to catch my breath and celebrate. Ben took video of me screaming my lungs out and swinging my arms in the air at the joy of just cleaning up one of the biggest and most difficult pieces of whitewater I have ever seen. 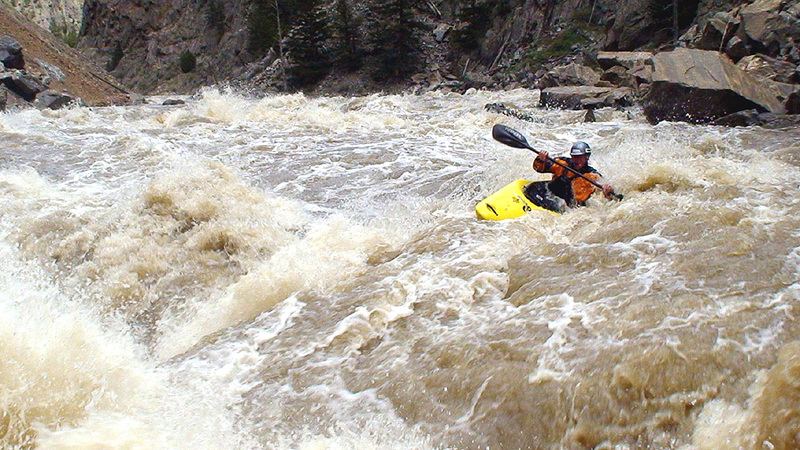 For those who have the great book 'Whitewater of the Southern Rockies', there is a great photo of Gore rapid on page 347. On this day, all of the boulders shown in this photo were completely covered! I got out of my boat and headed up the bank to talk with Ben and scout Pyrite. We looked at it for several minutes and I decided that despite my less than desirable line yesterday, I was feeling good and would give it a go today. The first hole in Pyrite looked about the same, but the second hole was much worse. Either way, I felt like there was a good opportunity to recover if something happened, so I headed back up to my boat to give er' a go. I lined up and hit the top hole perfectly, making it look easy. The author charges the top hole at Pyrite. Unfortunately, the current from the first hole pushed me farther left than I wanted. 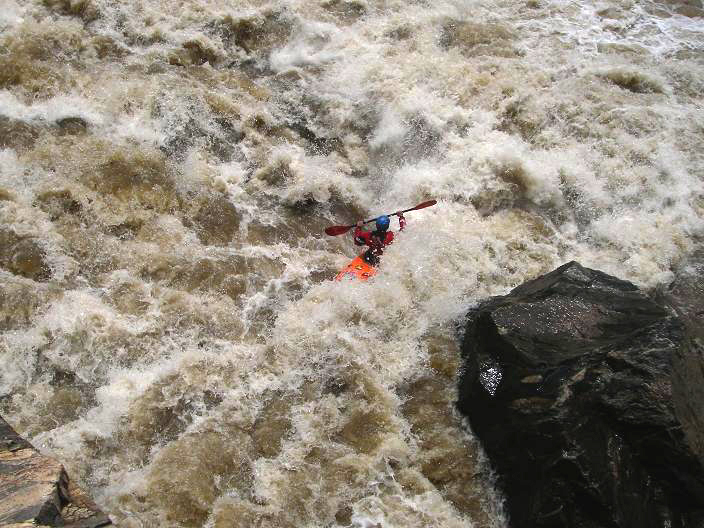 I was committed so I didn't hesitate, paddling hard as I accelerated for the hole below, hitting it dead on. 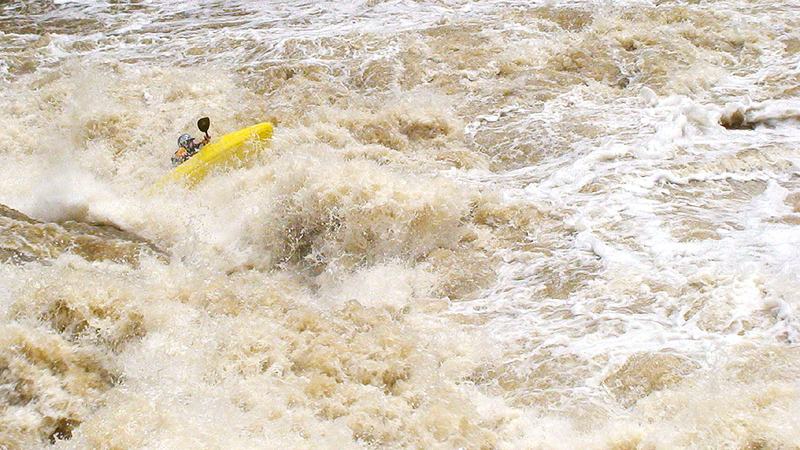 I went deep into the brown whitewater maw and could feel that I was still upright under the water. Sweet! I was feeling great about making it past the hole as I felt the river pushing me downstream and towards the surface. But the river had other plans for me! As soon as I resurfaced I felt myself going backwards so fast I had little time to react.. Sure enough I got pulled right back into the monstrous hole and then it felt like somebody stood on my left paddle blade, which in retrospect must have caught the green water. I got tossed one more time, then it felt like someone body-slammed the boat and me from the top row. I thought this was the green water driving me deep, but in fact it was the opposite. From the video we later saw that the boat and I were literally thrown out of the hole into the air; I have never seen or felt this before. I landed past the boil line and headed downstream, feeling very lucky to have escaped that one! The author battles the gigantic bottom hole at Pyrite..
Just after this photo was taken I did a violent aerial cartwheel out of the hole..
Just downstream I avoided another MASSIVE hole and looked back at potentially the most consequential rapid on the river at this flow, considering you can't sneak it. Ben got in with me and headed down to Tunnel falls. It was big yesterday and even bigger today. Luckily the higher water had the effect I had hoped it would which was to turn the undercut on the left into a reactionary. This made Tunnel better and we both ran it filming each other. Too fun! Below Tunnel we chased each other down the river, running Toilet Bowl on the left without incident. Next came Kirshbaums, which was beyond words! The waves, reactionaries, diagonals and holes were beyond description. I was truly paddling as well as I have in years, and I was still getting tossed around like rag doll. Again and again there would be a huge wall of water on one side of me and absolutely nothing on the other. We were working our asses off to avoid holes and stay upright. We took the left line this time to avoid the huge ledges. When I came out of there I was completely out of breath and awestruck by the power of what we had just paddled. Below the rapids we watched as massive amounts of wood floated down the river and enjoyed what was one of the most amazing days I have had in a long time! The car and food and stable ground at the take out looked as good as they ever have! Gore Canyon usually runs from July through early October. Flow information can be found online at the USGS site, look for the Colorado River near Kremmling, Colorado. Every year there is a downriver race held in Gore Canyon, usually in Mid-August. Check Mountainbuzz for more details. 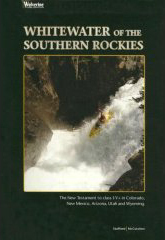 For complete Colorado beta check out the local guidebook, Whitewater of the Southern Rockies. This excellent resource was written by Kyle McCutchen and Evan Stafford and is available on Amazon.com. 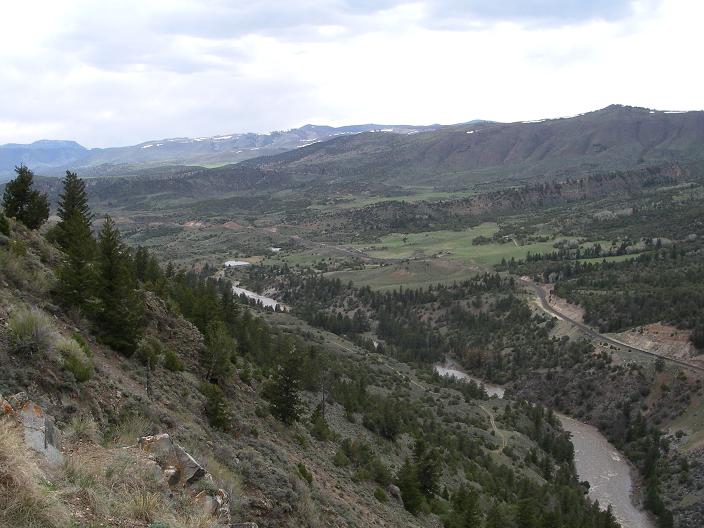 Gore Canyon is located in North-Central Colorado, as indicated by the marker on this Google Terrain Map, GPS coordinates: 40.017311,-106.470544. A Google Satellite Map view of Gore Canyon. You can see part of the flat water paddle-in on the top-right, and the train track running along the river-right side of the river. If you go to google maps and search for Gore Canyon, you can actually zoom in on some of the rapids.